We love a formal and finished tablescape and today we’re sharing a few of our favorite ways to elevate them. 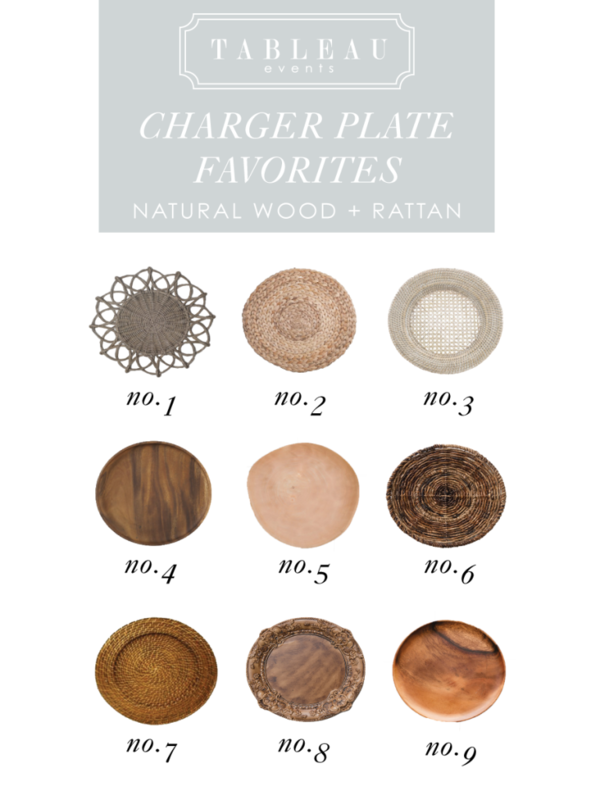 Natural chargers plates are too good not to add to your next celebration. Whether you’re planning a Northern Michigan wedding or a small fete for four on the patio, incorporating a charger always takes it to the next level. One of our favorite design tricks is to add a natural element whenever possible and these chargers do just that. We love the various shades of wood and rattan that range from bleached beach wood for an elevated coastal wedding to rich tones that give depth and feel regal enough for a country club event. The best part is natural elements can be used throughout the year. In fact, number 7 is a favorite in our personal entertaining arsenal that we frequently use for refined lakeshore weddings to casual dinner parties at home. It’s all about how you pair your decor and details.